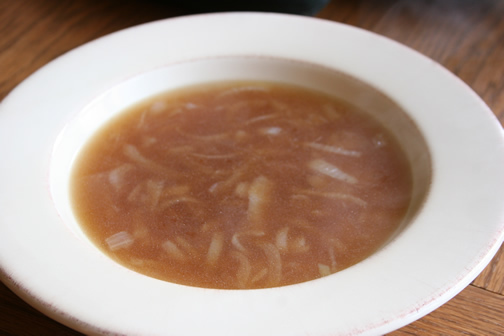 This is the best French onion soup I have ever made. The photo shows the soup prior to having the toast and cheese on top. It is so flavorful, there is no way you can eat just one bowl! :) It is a great one to freeze and use later. 1. Heat the butter and oil in a large stockpot on medium-high heat. Add the onions and sauté for 30-40 minutes, stirring only occasionally, until the onions turn a golden brown. Deglaze the pan with the sherry and brandy and simmer uncovered for 5 minutes. Add the white wine and simmer uncovered for 15 more minutes. 3. Preheat the broiler and position the rack 5 inches below the heat source. Ladle the soup into heat-proof serving bowls, cut the toasted bread to loosely cover the top of the soup, sprinkle generously with grated cheese, and broil for 3-5 minutes, until the cheese is melted and bubbly. Serve hot.